120 commercial establishments closed due to the situation of insecurity. 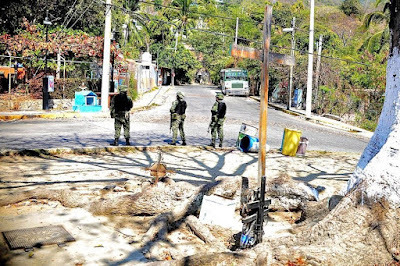 Acapulco, Guerrero.- Several colonias in Acapulco are paralyzed by the terror imposed by drug traffickers. The paralysis occurs after 72 hours in which the port registered murders, fires of transport units, shootings and persecutions. 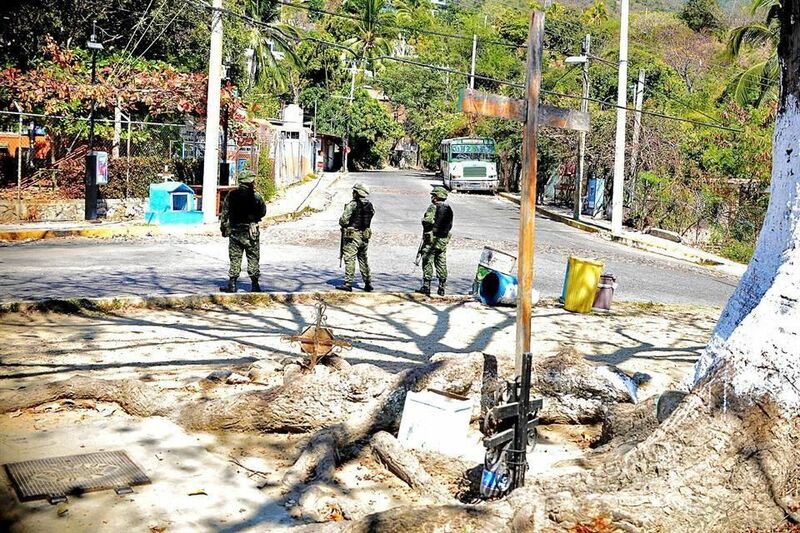 In the neighborhoods Jardín, Azteca, Almendros, Miramar, Jardín Mangos, Palmas, Tehuacán and Muro, a de facto "curfew" prevails from 8 o'clock at night. In those colonies dozens of schools, health centers, churches and stores are closed; public transport operates partially, affecting trips to and from other points in the port. And no one leaves his house after nightfall begins. Of the 600 units, including taxis and urban trucks, operating in the area, less than half provide service. "Those who dare to use the services know that their life is in danger," revealed a trucker leader. 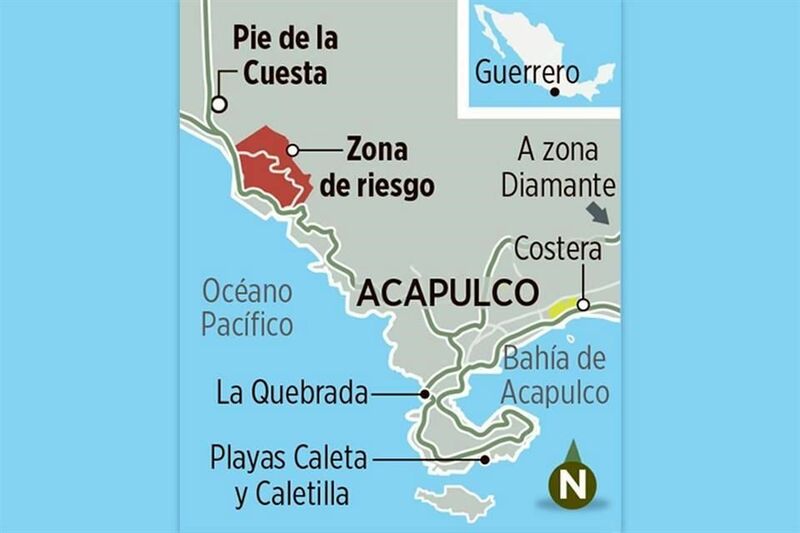 The zone in question connects Pie de la Cuesta with the traditional Acapulco, and the paralysis also affects shops and hotels in other places. The schools and establishment closed after Wednesday night, when an urban transport truck was burned and two shootings were recorded in Colonia Jardín Mangos. Alejandro Martinez Sidney, leader of the Federation of Chambers of Commerce in Acapulco, said that in recent weeks, a new group of extortionists is demanding a fee from businesses. "Many are already paying double quota, which in some cases is up to 1,000 pesos a day that they pay to each group," said Martinez. The businessman pointed out that, so far this year, 120 commercial establishments closed due to the situation of insecurity. Elements of the Army were deployed to the west of the port to reinforce the surveillance. Imagine this guy becoming mayor! Wow. it seems extortion is quite rampant . Is it all across Mexico ? Does it often end in murder for those who resist ? How does that stack up compared to the same type practices in the USA ? I myself don't see it happening here , but that don't mean it don't . Has the northern states calmed down any and become any safer ? Really I open up this site and see all of this murder and mayhem and wonder if its like this . Not yet have I driven through Dallas or Houston or OKC and run into city busses hijacked and burning across intersections in a attempt to contain targets . That would be a visual type thing where the extortion wouldn't . I have friends that just went to Acá and stayed at one of the resorts. They claimed that all the bad news about Aca is BS !! Typical........also claimed the hotels were ALL full......Ya right......everything was just heavenly, esp if you don’t speak the language and only communicate with English speaking Resort workers. I’m just landing from a trip to Acapulco. Still best weather and view but it’s a failed city and plenty of violence in tourist zone. Mexico is lost, forever. Sad! Looking forward to Anarchapulco 2018! See everyone this week in Acapulco! Danny we are lucky to live in the good ol U.S. of A. Out of all these articles I read I can only imagine how quickly these groups would be mowed down by our local pd, fbi etc. The flip side to it is that this country is the fuel that lets these criminals operate. God bless all the raza down there that are trying to make a living. On Sunday,we drove south to Playa Ventura, which is two hours away. The government is spending big bucks on new roads. A local guy told me two years ago that it is safer. It appeared much safer. Going north from Acapulco, not so much. 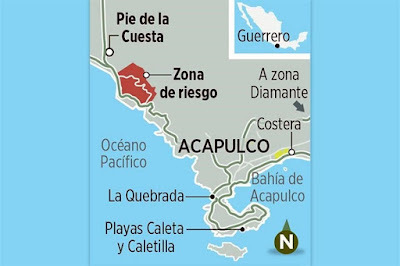 That part of Acapulco used to be up and coming until they changed the airport from Pia De La Cuesta to Diamante in the south of Acapulco. The mayor of San Marcos,one hour south of Diamante, has,says he will not permit the gangs to take over. He also has permitted the auto defence groups. Compared to twenty years ago, the middle class has cone up, Yesterday at Playa Ventura, the palapas were packed full of locals,'from the area, shelling out $150 pesos a plate for fish dishes, $80 pesos a plate for oysters. In the area of Acapulco, where this article. From what I have heard, is that the military goes in, the cockroaches scatter, no one want to testify for fear if reprisals. It seems the most dangerous jobs in Acapulco are Taxi Driver and working at the Mercado Central.